ORGANIC I 340｜ORGANIC COTTON｜IKEUCHI ORGANIC Inc.
Soft, thin and light. 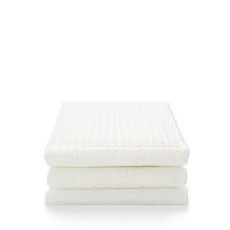 Yet Organic Waffle still pampers your skin with gentle comfort. The light, quick way it absorbs water is so exceptionally simple, smart and easy that it becomes addictive. Our quality assured waffle series boasts rich character that allows you to enjoy the full depth of organic cotton textiles whose texture changes gradually with use. Cool and quick-drying in summer, warm and comforting in winter. The secret lies in the unique texture of waffle fabric. 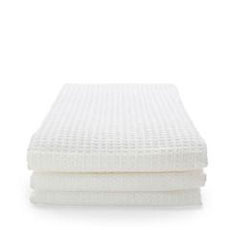 The stable firmness of organic cotton creates a thick fabric, trapping air in the waffle weave which allows it to absorb water well and dry quickly. 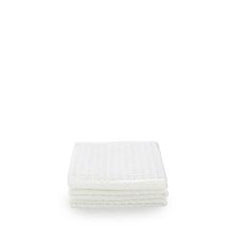 Enjoy the supreme comfort and rich character of waffle fabric made with strong organic cotton. 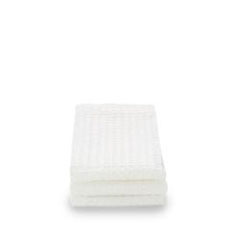 Fluffy yet compact waffle towels are perfect for the handbag or kitchen. A great assistant for chefs as they clean effortlessly, dry quickly, and stand up to frequent use. Additionally, the meticulously calculated structure creates a resilient thick texture, and assures exceptional overall durability. Experience for yourself the handy simplicity of organic waffle designed to satisfy the most demanding chefs.